Elizabeth S. Taylor received her B.A. in American Studies at Smith College, earned her PhD in American Literature from Brown, and then taught at Harvard for five years before returning to Brown in 1994. She teaches in the Nonfiction Writing Program in the Department of English at Brown. She teaches creative nonfiction—personal and academic essay, literary journalism, historical narrative, and memoir. 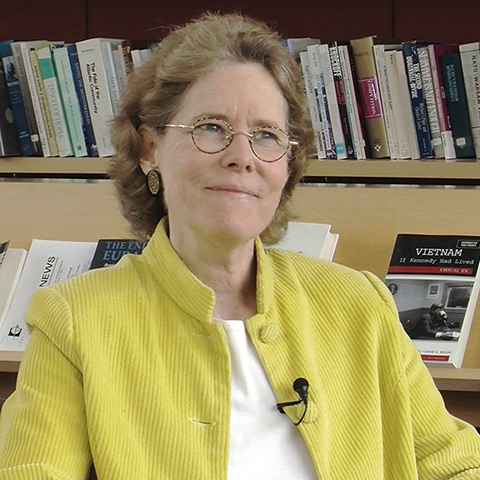 She has published essays about the teaching of nonfiction and about the Vietnam War era. Her most recent book isThe Plain Language of Love and Loss: A Quaker Memoir (University of Missouri Press, 2009). She has a particular interest in mentoring students interested in all forms of nonfiction writing. Taylor’s Vietnam War essays and other works can be found here. How diverse are the perspectives in writings about Vietnam? Does reading fiction help us understand history? Is it important to distinguish between fiction and non-fiction writing about Vietnam? Did different portrayals of the Vietnam War change people’s understanding of the war? What issues are raised in writings about the Vietnam War? Why is it important to understand the experiences of individuals? Why is it important for high school students to learn about the Vietnam War? What are the different ways to approach understanding the Vietnam War?